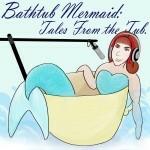 In which the Bathtub Mermaid talks about card games, kickstarter, and watching her relatives from behind the hutch. Growing up, we always had the typical Bicycle cards in red and blue, lying around the house. So many of my childhood memories involve watching my grandparents, aunts and uncles, and older cousins gathered around the dining table with it’s vinyl floral tablecloth. Cups of strong coffee and glasses of homemade iced tea would share space with ash trays and plates of cookies (Stella D’oro anisette toast and Pepperidge Farm Milanos). Voices would be raised in affectionate bickering or exuberant laughter, and all of it would just be counterpoint to the real action: a friendly game of cards. Read the full essay at All Things Girl. Nuchtchas of Nutty Bites, for support, and for providing her promo.